We present to you a series on some of Hindi cinema's most powerful stars, chronicled by veteran film critic Dinesh Raheja. Here's proof that a Hindi film heroine's career does not go kaput when she gets married: Legendary actress Nutan. She remained an A-list star for a decade and won three (of four) Filmfare Best Actress Awards AFTER marriage and the birth of her son Mohnish. Nutan, it seems, always had this ability to pull off the unconventional. Her mother Shobhana Samarth (the 1940s star who played Seeta in the superhit Ram Rajya) didn't expect a celebrity career for her teenaged daughter. Nutan was tall and gangly at a time when beauty meant petite and plump. 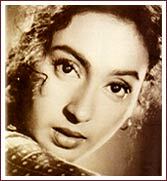 True, Nutan had essayed a small role as a child aritiste in the mid-40s Nal Damayanti. But Shobhana was surprised when biggie Chandulal Shah offered to cast her adolescent daughter opposite stars like Raj Kapoor and Dilip Kumar in his next film. Shobhana finally detected that special, lit-up quality in 14-year-old Nutan's eyes. Chandulal Shah's offer fell through. But Shobhana Samarth launched Nutan as an adult artiste in the aptly-named film, Hamari Beti (1950). It was a show of feminist fervour: Shobhana produced and directed Hamari Beti (her family remained matriarchal till her recent death). The film didn't make Nutan a star but the very next year, the success of Nagina and Hum Log ensured middle-level stardom for Nutan. Nagina was an adults-only film. Interestingly, a diligent watchman outside a theatre screening the film barred Nutan from watching her own film because she was still underage! Despite her early success, Nutan was often dismissed as 'too thin'. For the next few years, she didn't make much headway: Shikwa was stalled, thus nipping her bid to act opposite megastar Dilip Kumar (they make an exquisite couple in the rare footage salvaged). And her big films like Shabab (costarring Bharat Bhushan) with Naushad's mellifluous music were disappointments. At this stage, the mercurial Shobhana took an unprecedented step: She sent 18-year-old Nutan to La Chatelaine, a finishing school in faraway Switzerland. Nutan enjoyed it tremendously; her schoolmates had no idea that she was an actress in Mumbai. When Nutan returned, filmmakers looked at the exotic, Westernised heroine with new eyes. She landed the title role in Amiya Chakraborty's Seema about a juvenile delinquent at the cusp of childhood and womanhood. Her eyes flashed fire in the intricately-sung Manmohana bade jhoothe picturised on her (even singer Lata Mangeshkar was impressed). Her character's stricken soul was brought to heart-breaking life as she fought a moral maelstrom while hungrily inching towards a fallen coin. Seema was a hit and won Nutan a Best Actress Award. She never looked back. Here was an actress who could change gears with well-oiled efficiency: She was the very essence of featherweight froth in films like Paying Guest and Anadi and made a splash by posing in a swimsuit for Delhi Ka Thug (though in a distinctly schoolgirlish costume). Nutan also gave cry-from-the-soul performances in Sone Ki Chidiya (as an exploited actress) and in Bimal Roy's classic, Sujata (as a girl who strives to cross the chasm of caste and be fully accepted by her foster family). In 1959, the year in which she rode high with hits like Sujata and Anadi, Nutan did the unconventional and got engaged to Commander Rajneesh Bahl. Years later, Nutan's sister Tanuja's daughter, Kajol, did much the same when she got married to Ajay Devgan soon after a string of hits. After a quiet spell in the early 1960s when she gave birth to her son Mohnish, Nutan was back in the studios. During her absence, Bimal Roy had chosen newcomer Sadhana for his Parakh and Prem Patra, casting her in the Nutan mould, a fact Sadhana herself corroborates. "Nutan was my idol," Sadhana has always maintained. Recalling that they made a fine pair, her hit costar Dev Anand has said, "Nutan was one of the few actresses with whom one could have an intelligent conversation." In 1963, Nutan had two diametrically different films released within a month of each other --- Bimal Roy's sombre Bandini and Dev Anand's jaunty crowd-pleaser Tere Ghar Ke Saamne. Bandini was Nutan's tour de force. Her insightful performance of a quiet woman yoked to a hopeless love that drives her to murder and an eventual search for retribution still ranks among the best ever seen in Hindi films. In the 1960s, Nutan formed a hit pair with Sunil Dutt in a string of successful south melodramas like Khandaan, Meherban and most famously, the three-tissue reincarnation saga, Milan. Songs like Tumhi mere mandir, tumhi meri pooja, tumhi devta ho (the song won Lata her last Filmfare Award before she begged off competing at awards), strengthened Nutan's Devi image. Even her famous court battles with her mother over money matters did not much affect Nutan's career or image. Though Nutan acted in Shammi Kapoor extavaganzas like Laat Sahab clad in skirts and pants, the public seemed to prefer her in the sari-clad, self-sacrificing Saraswatichandra mould, secretly wiping away a tear and singing Main toh bhool chali babul ka desh. This hit garba song was one of Nutan's few, full-fledged dance numbers. Nutan continued to get interesting roles even after she crossed 40. She could portray strength of character --- as seen in her award-winning role in Raj Khosla's Main Tulsi Tere Aangan Ki and others like Saajan Bina Suhagan, Saajan Ki Saheli, Teri Maang Sitaron Se Bhar Doon, Rishta Kagaz Ka. Filmmaker Subhash Ghai cast her in a pivotal role in his Meri Jung and then fulfilled the wishes of several filmgoers (even if it was a little late in the day) by finally casting Dilip Kumar and Nutan together in his Karma (1986). By the late 1980s, Nutan began veering towards bhajan singing, her farmhouse and her son Mohnish's career. A dreaded cancer began to take its toll but Nutan was lucky enough to see son Mohnish establish himself in the industry with Maine Pyaar Kiya before she passed away in 1991. The favourite of creative people from Manmohan Desai to contemporary actors like Sachin Khedekar, Nutan has left behind a body of work that continues to garner admiration and respect for an unforgettable face that instantly mirrored the landscape of her soul.